These Almond Toffee Triangles are a favorite of my husband’s and it’s a holiday tradition in his (and now our) family. So of course I had to learn to make them, just like other dishes he grew up with, like squash casserole and Victorian French Toast. 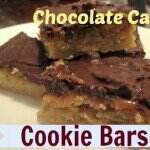 These have a cookie base with a toffee topping. 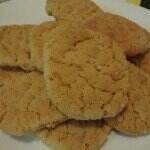 They are more brittle than cookies, but less than toffee. 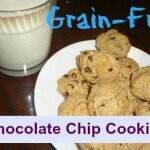 Mix brown brown sugar, margarine, corn syrup, egg and vanilla. Stir in flour and salt. Spread dough in a greased 15 1/2×10 1/2x 1inch jelly roll pan and bake at 350 until light golden brown-18-20 min. After about 10 minutes into baking, prepare topping so it is ready when the cookie base comes out. Cook and stir brown sugar and corn syrup over medium heat until sugar is dissolved. Stir in margarine and cream. Allow to simmer, then turn off heat. Stir in vanilla and almonds. Pour over baked layer and spread evenly. Return to oven and bake until light brown and set, about 15 minutes. Allow to cool and cut into 2 1/2 inch squares. Cut each square diagonally into halves. Looks good and would be a great gift for others for Christmas. I would even try using cashews with it too. This would be a great project to get all the grandkids together on the weekend. 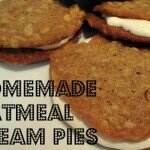 Love this reciepe and so easy to make. 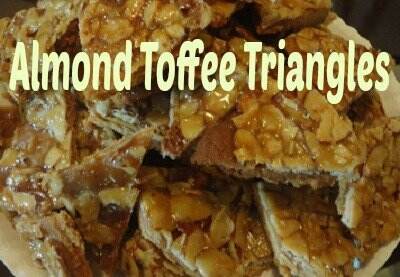 We love peanut brittle but Almond Toffee triangles looks so yummy. These look so good. 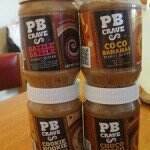 I am going to try these next week. Thanks for the recipe! I’d love to know how they turn out for you!